About a dozen protesters weren’t discouraged Saturday by the news that the Idaho Transportation Department will soon allow at least two oversized loads of oil refinery equipment to travel through Moscow on U.S. Highway 95. 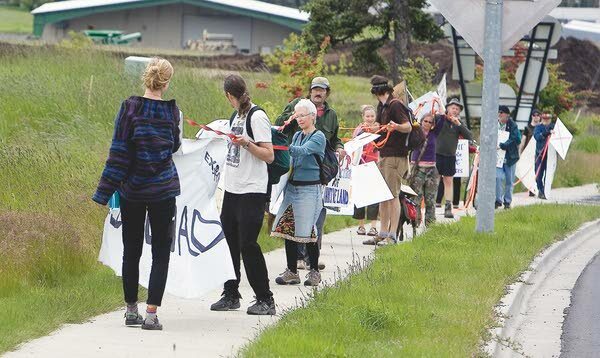 Members of Wild Idaho Rising Tide (WIRT) organized the demonstration that began mid-morning where Southview Avenue meets the highway south of downtown Moscow. Protesters marched north on the highway through the city while carrying a 208-foot-long rope outline of one of the loads, which in real life is 23 feet wide, 208 feet long, 13.6 feet tall, and weighs 410,300 pounds. The Idaho Transportation Department issued two permits Friday for Imperial Oil/ExxonMobil to transport the loads from the Port of Lewiston into Montana via U.S. Highway 95 and Interstate 90 beginning June 27. The equipment is destined for the company’s oil sands project in Alberta, Canada. Helen Yost, a University of Idaho (UI) graduate student and member of WIRT, said the demonstration was one of many held across the world Saturday to protest the oil sands project. She said the project creates health problems for Canada’s First Nations people, has killed thousands of birds, and results in ponds of toxic waste. “If it’s developed, there will be no way to turn back climate change,” she said. Alberta is host to 171 billion barrels of oil reserves, the vast majority of it in the form of bitumen, which is viscous oil that has combined with sand and water. The oil sands projects extract bitumen from sand and water so it can be upgraded into conventional petroleum products, according to the government of Alberta. Yost said because the oversized loads will be used to develop the oil sands refinery, she feels a moral obligation to speak out against their movement through Moscow. “There are so many Moscowites opposed to these trucks coming through our hometown,” Yost said. The environmental implications of the oil sands project compelled a UI sociology major to participate in Saturday’s demonstration. He said he’s worried about global warming and said governments need to invest in alternative energy. He and Jilot said they’ve discussed the issue on their KUOI 89.3 FM radio show during the past year. The government of Alberta maintains an informational website about the oil sands project at http://www.oilsands.alberta.ca, as does Imperial Oil at this shortened link: http://goo.gl/DwdSi. 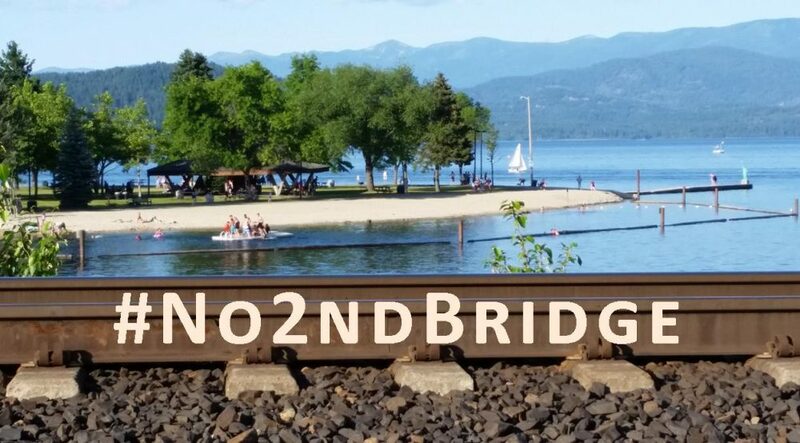 Information about Wild Idaho Rising Tide can be found at https://wildidahorisingtide.org/. This entry was posted in Anti-Tar Sands Megaloads Protests and tagged No Tags by WIRT. Bookmark the permalink.